In this study, the phenomenon of uneven gas distribution at different sections in the continuous annealing process, which affects the instability of the section furnace temperature and can cause accidents that exceed safety thresholds for a long period, was analyzed to establish a furnace temperature prediction model and a multi-objective optimization method for section gas was proposed. First, the industrial production process was analyzed to extract key factors that affect furnace temperature and combine them with the SVR algorithm to establish a prediction model for furnace temperature. Then, a multi-objective optimization constraint set and optimization objective function were constructed based on the constraints of the production process and equipment conditions. Finally, based on the prediction model, the constraint set, and the objective function, a multi-objective optimization algorithm was employed to optimize section gas based on the NSGA-III. The experimental verification and production results demonstrate that a model constructed using actual collected data yields excellent prediction results. When the multi-objective optimization method was implemented and put into production, the steel coil over-temperature alarm ratio was reduced and the average over-temperature alarm time was greatly reduced. The proposed method improves the production environment and ensures that the procss is safe and stable. Y. Zhang, W. Cao, and Q. Qu, “Multi-Objective Optimization for Gas Distribution in Continuous Annealing Process,” J. Adv. Comput. Intell. Intell. Inform., Vol.23, No.2, pp. 229-235, 2019. H. T. Liu, H. Z. Li, and H. L. Li, “Effects of rolling temperature on microstructure, texture, formability and magnetic properties in strip casting Fe-6.5 wt% Si non-oriented electrical steel,” J. of Magnetism and Magnetic Materials, Vol.391, pp. 65-74, 2015. X. P. Wang, L. W. Yang, Z. M. Dong, and B. Zhang, “Multi-objective operation optimization of continuous production process with safety constraints,” Control and Decision, Vol.33, No.10, pp. 1740-1746, 2018. 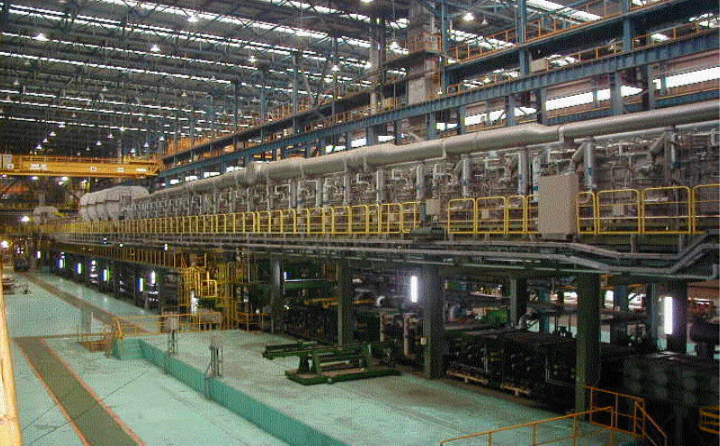 R. Wang, Z. H. Bai, M. X. Zhang, C. Qian, and Y. X. Wang, “Comprehensive optimisation technology of roller profile in continuous annealing furnace,” Ironmaking and Steelmaking, Vol.45, No.6, pp. 519-522, 2018. Y. Y. Zhang, W. H. Cao, and M. Wu, “Subspace modeling method for burn-through point,” J. Adv. Comput. Intell. Intell. Inform., Vol.20, No.2, pp. 279-286, 2016. H. Wu, R. Speets, F. Heeremans, O. B. Driss, and R. V. Buren, “Non-linear model predictive control of throughput and strip temperature for continuous annealing line,” Ironmaking and Steelmaking, Vol.12, No.8, pp. 570-578, 2015. I. Giagkiozis, R. C. Purshouse, and P. J. Fleming, “An overview of population-based algorithms for multi-objective optimisation,” Int. J. of Systems Science, Vol.46, No.9, pp. 1572-1599, 2015. L. Z. Liu, H. B. Mu, and J. H. Yang, “Generic constraints handling techniques in constrained multi-criteria optimization and its application,” European J. of Operational Research, Vol.244, No.2, pp. 576-591, 2015. Z. K. Feng, W. J. Niu, and C. T. Cheng, “Multi-objective quantum-behaved particle swarm optimization for economic environmental hydrothermal energy system scheduling,” Energy, Vol.131, pp. 165-178, 2017. W. J. Kong, T. Y. Chai, J. L. Ding, and Z. W. Wu, “A real-time multiobjective electric energy allocation optimization approach for the smelting process of magnesia,” Acta Automatica Sinica, Vol.40, No.1, pp. 51-61, 2014. R. C. Peralta, A. Forghani, and H. Fayad, “Multi-objective genetic algorithm conjunctive use optimization for production, cost, and energy with dynamic return flow,” J. of Hydrology, Vol.511, pp. 776-785, 2014. C. F. Juang and C. D. Hsieh, “A fuzzy system constructed by rule generation and iterative linear SVR for antecedent and consequent parameter optimization,” IEEE Trans. on Fuzzy Systems, Vol.20, No.2, pp. 372-384, 2012. R. Baly and H. Hajj, “Wafer classification using support vector machines,” IEEE Trans. on Semiconductor Manufacturing, Vol.25, No.3, pp. 373-383, 2012. L. W. Wei, Z. Y. Chen, and J. P. Li, “Evolution strategies based adaptive L-p LS-SVM,” Information Sciences, Vol.181, No.14, pp. 3000-3016, 2011. D. L. Liu, L. Li, and X. H. Chen, “Optimization of Orthogonal MSK Waveforms for Active Sonar Using Genetic Algorithm,” J. Adv. Comput. Intell. Intell. Inform., Vol.23, No.1, pp. 84-90, 2019. W. Bi, G. C. Dandy, and H. R. Maier, “Improved genetic algorithm optimization of water distribution system design by incorporating domain knowledge,” Environmental Modeling and Software, Vol.69, pp. 370-381, 2015. M. Cisty, Z. Bajtek, and L. Celar, “A two-stage evolutionary optimization approach for an irrigation system design,” J. of Hydroinformatics, Vol.19, No.1, pp. 115-122, 2017.